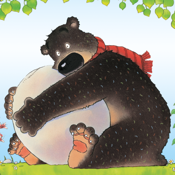 Join Hugless Douglas on his search for the perfect hug in this engaging app with animations, sound effects and music. When Douglas, a huggable lovable bear, wakes up one morning in need of a hug, he goes to try and find one… but none of them seem quite right. Choose to read the story yourself or hear it read aloud by Alan Davies. Children will love exploring each page and discovering the touch activated animation on every screen. This app comes with a noughts and crosses game and a fantastic hug gallery. Perfect for families on the go, this interactive version of the bestselling picture book is bursting with love, hugs and laughter! David Melling is an internationally acclaimed children’s author-illustrator and his bestselling books perfectly combine humour and charm. The irresistible Douglas is certain to enchant and delight adults and children alike. Play – send hugs to your friends using the hug gallery or play the fantastic noughts and crosses game. Visit www.hodderchildrens.co.uk to discover a world of perfect books for every age. Then select back “lock rotation” for the side switch. If your apps have no sound, try flipping the orientation lock button above the volume buttons. If that fixes it and you don’t want it to happen again, go into the general settings and change “Use side switch to” to “Lock Rotation” instead of “mute”.